WW Associates is currently organized into primary divisions of administration and marketing, civil engineering, surveying services, landscape architecture & planning. Our professional and support staff take a complete team approach in planning and developing your engineering, surveying and infrastructure objectives. 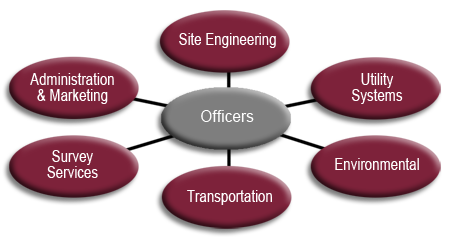 We organize our personnel using a project team approach for each project. We organize a project by preparing a detailed scope for the project that is reviewed by all project stakeholders. We then brief project team personnel of this project scope. Project team members are directed to perform site visitations as well as previous document review prior to initiating studies, designs, and surveys. We plan for frequent team meetings with all stakeholders to ensure good internal communications. Our project managers ensure that client contact is maintained at all times. We believe strongly in “following up after the sale”. Our project managers are senior engineers with significant experience in a wide variety of projects. We feel that all project managers need to be specialized in their respective fields and have experience “on the boards” to allow for appropriate decision-making on both concept and design related issues. We believe this is key to properly controlling a project. Each project is also assigned an officer in charge who ensures the project manager receives the resources necessary to complete the project on time and within budget. The officer in charge also provides quality control and mentoring assistance for each project manager.